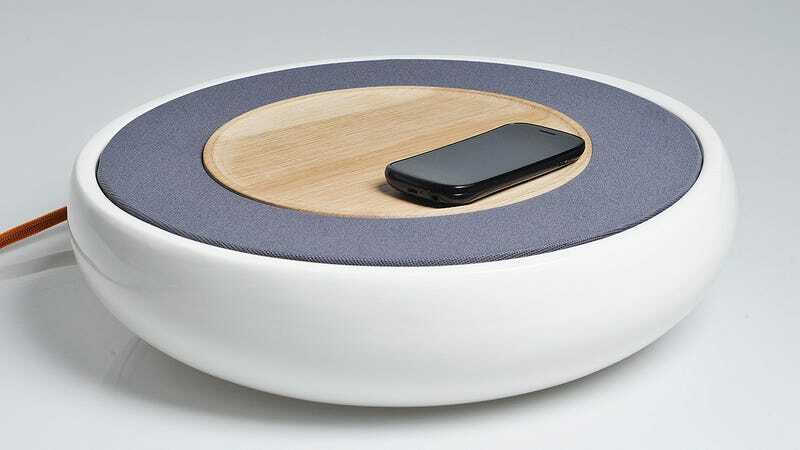 Dismayed by the over-complicated control schemes of wireless speakers that usually result in redundant playback and volume controls, Victor Johansson, an inspiring product designer, came up with a better solution: a minimalist ceramic speaker that only cares about where you place your phone. Instead of buttons or other physical controls, the speaker uses a set of sensors to determine where a phone has been placed on its surface. There are three distinct zones that control three different functions. Placing it one spot starts playing your tunes, placing it in another pauses the playback, and the last turns on the radio instead. Volume, track selection, and other playback options are all left up to the device being used to minimize redundancy, while glowing indicators light up momentarily to indicate the current mode. Now how's about building a better toaster that perfectly heats my Pop Tart when placed on top?